What I mean by that is that I'm not that bothered about the finished result. Which may explain why I very rarely have a finished result! I knit for the process. There's something so therapeutic about repetitive stitching, fingers moving swiftly, the juxtaposition between cool metal (or smooth bamboo) and soft yarn, counting silently to the rhythm of each stitch. I used to while away long commutes with some kind of knitting project, rushing those last few stitches so that the row was complete before we arrived at my stop. I've struck up conversations with random strangers curious about that young(ish!) girl clicking away in the corner of the train. What are you making? Who's it for? I wish I could knit. Etc. etc. Knitting takes your mind off things because it causes you to concentrate on the task at hand. You become so focused on the motions of your fingers that the cares and stresses of the world and all the busyness of life melt away into the background. It's just you. Your needles. And a ball of wool. Since Ruby was born there's been very little time for such indulgent pleasures! Even if I started a project during naptime I would be waiting for her to wake up mid row, during a complicated stitch pattern. All kinds of stitchy disasters could ensue! But then on my trip to DK Books, I was given this beautiful tome full of gorgeous, sweet, cute baby yarn goodness. How could I let this candy coloured book sit on the shelf collecting dust? And once again, I felt the urge to knit. I started the set of building blocks because surely I could knit 18 tiny squares in between naps and feeds! I've been working at a rate of one square per evening, and there are six stitch patterns to keep it interesting. What a fun project! It's a gorgeous book with a great range of projects including clothing, toys and interiors. They would make beautiful gifts for the little people in your life or for that pregnant friend and each project is so achievable. If you've got a stash of baby soft DK yarn to get through then these projects are sure to make you want to pick up those needles! 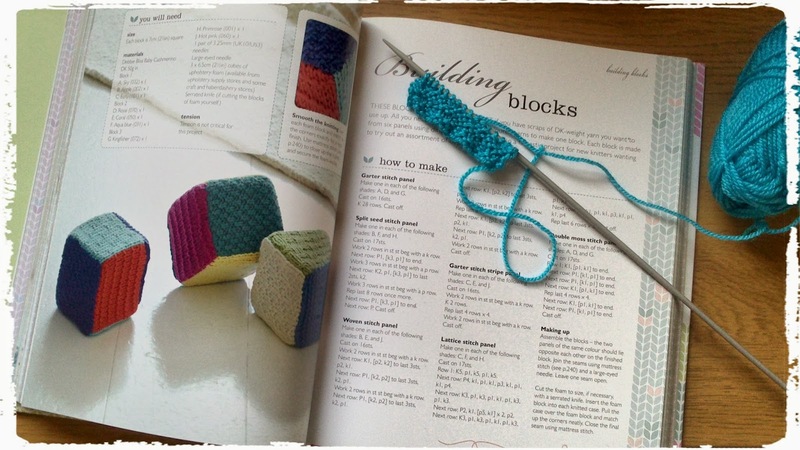 And if you're a newbie knitter then the How to Knit section is among the best and most comprehensive I've seen, with clear illustrations and instructions for every stitch. Check out the DK website for more information and to view sample pages. Disclaimer: I wasn't paid to write these lovely things, I just wanted to share because I truly enjoyed the book. DK Books did kindly give me the book during an unrelated focus group but I chose to review it without being asked. Right! Glad we're all clear on that front!